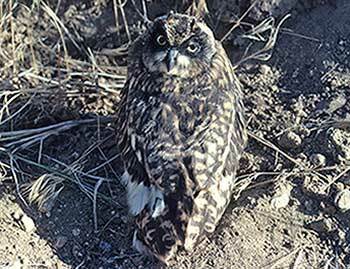 This ground owl reminded me that we are looking back to the times of the emigrants who traveled the Hastings Trail from 1846 to and including 1850. 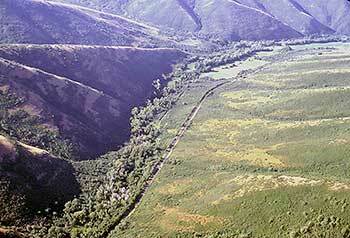 The first emigrants on Hastings Cutoff used several different trails when they crossed the Salt Lake Valley. The Bryant/Russell Party, came through Weber Canyon and traveled along the foothills to City Creek where they camped near where Temple Square is today and probably the same camp ground used by the Fremont party the previous year. From Bryant's description they then went south the next day about 4 miles to the crossing on the Jordan River that Clyman and Hastings used in the spring. After crossing they proceeded to the Oquirrh Mountains and around into Tooele Valley. The Harlan/Young wagon party, after laboring through Weber Canyon, turned south and climbed the hill where US-89 is today. They then had to follow Kays Creek to the south west to keep from crossing the creeks deep wash near the mountain. They probably camped at Farmington and on the next day they followed along the base of the mountains then crossed the ford on North Temple and camped near Garfield at the Oquirrh Mts. 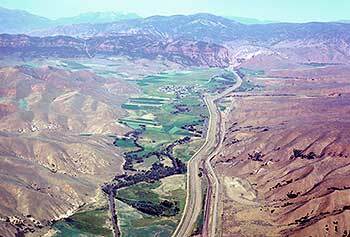 This picture is of the Weber River Valley from Echo to Wanship with the Weber River Canyon in the top center. The Lienhard Party, came out of Weber Canyon and camped near Kays creek then on the next day followed near the shore of the lake and camped on the Jordan River. Historians figure they crossed the Jordan about 5 or 6 miles north of the North Temple crossing and headed for the Oquirrh Mountains at Magna then followed the Harlan/Young Trail around the mountain. The Donner/Reed Party came out of Emigration Canyon into the valley, followed Emigration Creek on the south side, crossed Parleys Creek and Mill Creek then followed Mill Creek to the Jordan River where they camped just south of 2700 South. The next day they crossed the Jordan probably at the same crossing as Clyman/Hastings and Bryant /Russell used. After crossing the river the trail probably followed the slight rise in the ground - about 3100 South -to stay out of the wet areas on their way to where the city of Magna is today. Near here they intersected the road made by the emigrants in advance of them. The Mormons came into the valley the next year and established Great Salt Lake City on City Creek. The emigrants, the following years, followed the Mormons into the city where they camped near by the City then crossed the Jordan River at North Temple and followed the Harlan/Young road to the Oquirrh Mountains and onward. This is East Canyon. The trail is left of the highway near the trees and running parallel with the highway on the right. The Little Delle Reservoir now covers the green flatland in the top right of the picture. This is the Donner Reed-Mormon Trail over Little Mountain. The trail is curving to the left of the greener straighter pipe line on the right. 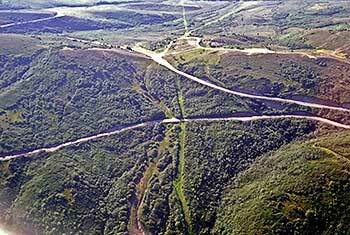 The Emigration road cuts across both lines.